Holiday brunch, for me, is just about as important as the “big feast”, especially when it comes to celebrating the holidays themselves. Whether it’s a simple strata and mimosa with immediate family (last year) or a buffet brunch for a small crowd (this year), there’s something about that bright morning, after the din and hype of the main events have passed that I appreciate. I really absorb that particular moment, which probably has everything to do with it being the denouement of it all. I slooow down finally, after the mad dash that is the holidays and the whirlwind actually soaks in. And, therefore, however special this particular meal is too, it has to be the opposite of hectic. I say for this one, splurge on ingredients, make things rich and delicious, but make it stress-free. The menu that follows can be made in advance of anyone arriving–with the exception of the eggs that can be mixed about half an hour ahead but made a la minute in around 8 minutes. Follow the very easy work-back below, keep things warm in a low oven until you’re ready to serve. a holiday brunch menu–and the plan! Buy your groceries and don’t forget about coffee, tea, cream, orange juice and something sparkling to pop open. Set the table–every single piece including specific serving platters and serving utensils, trivets, napkins, cutlery, your tea service, spice shakers and condiments. You can fill them the day of but having them placed will save time, avoid scrambling and help you make room for everything you’re serving. Make sure your setting is functional for a buffet: plates, napkins and cutlery should precede the first dishes, glasses should be close to pitchers and bottles with room left to safely pour. Dessert, if placed on the same table, should be clearly defined–the use of a running or place-mats can denote that area clearly, for instance. Make cake, cool, cover tightly with cling wrap and refrigerate. Remove cake from fridge, carefully cut into squares within cake tin and serve as is or on platter to allow it to come to room temperature. Slice and set out pats of butter to allow them to soften. Set out salt, pepper, sugar and any other condiments for the meal like any preserves and preserved vegetables or pickles and sugar for tea or coffee. Peel, slice and layer potatoes. (You may want reserve potato scraps, of which you’re left with many in the recipe above. You could quickly chop them, oil and freeze them for a hash some other time.) Bake potatoes. Meanwhile, mix batter and make pancakes (30-45 minutes before guests arrive) and place on cookie trays lined with cooling racks to keep the pancakes from becoming soggy. Once potatoes are done, remove and then lower oven temperature and when it’s dropped, hold pancakes and potatoes there. 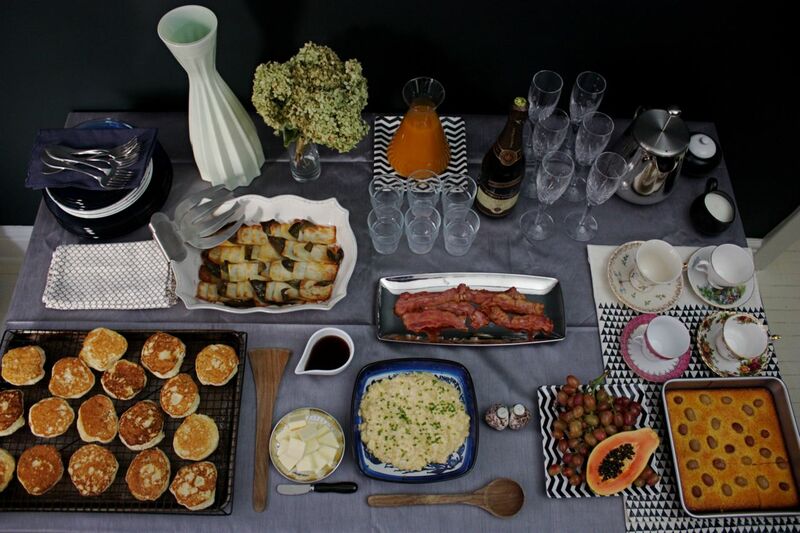 Pop your sparkling wine and serve mimosas as your guests arrive. Set juice, milk or cream for coffee and fruit out. Fry any bacon or breakfast meat (here you may want to use more than one skillet to make things go faster) and keep warm. Scramble eggs and plate. Transfer everything from the oven to the table. Eat! Lastly, make tea and coffee as everyone goes to the table for seconds of the main course. Enjoy dessert and don’t clear a thing for hours–enjoy your day!